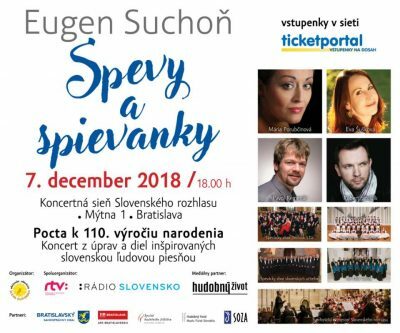 At the concert Songs and Singings, which is a tribute to the 110thanniversary of birth of the founder of the Slovak national music Eugen Suchoň, will be for the first time in Slovakia performed in public the collection of his pieces aimed on arrangements of Slovak folk songs. At the same time will resound the compositions Singings, Slovak Folk Songs, Songs from Terchová, Songs from the Mountains, which were inspired by folk songs. The pieces will be performed by four prominent Slovak choirs with the participation of the Symphonic Orchestra of the Slovak Radio and leading Slovak soloists. It is an unusual and unrepeatable concert format, which announces among others the next year’s anniversary: 70 years since the premiere of our second to none national opera Krútňava, in which Suchoň’s compositional mastership in terms of folk song reached its peak. Symbolically also the today’s excellent performer of one of the lead characters (Katrena) of the opera Krútňava will present herself – Mária Porubčinová.